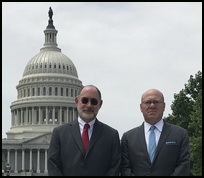 Knife Rights is pleased to announce that we have engaged the bipartisan government relations firm Capitol Hill Consulting Group (CHCG) to lobby for us in Washington, D.C. They will be working with our friends and allies in the capital to help us pass the Knife Owners’ Protection Act including repeal of the Federal Switchblade Act (KOPA – H.R. 84). A few weeks ago Todd Rathner and I were in D.C. meeting with Members of Congress and others. Those meetings were as successful as we might have hoped and we are making significant progress. For all involved, there is a sense of urgency. This is our best chance ever of getting rid of the archaic Federal Switchblade Act. It may well be a once-in-a-lifetime opportunity. Nobody knows what the midterm elections will bring, so we really must plan to get it done in the next 16 months. Hiring CHCG gives us the edge we need to slice through the quagmire on Capitol Hill and finally get rid of the absurd Federal Switchblade Act. D.C. lobbyists don’t come cheap. This is going to be a real stretch for us. We need your help now more than ever! Scroll down to find details on our BIGGEST EVER Ultimate Steel™ fundraiser and Tail End Bonus. Please donate! You can also help by contacting your members of Congress about KOPA. Click here to find our Legislative Action Center links at the bottom of the page that make it easy to do so.